Climateer Investing: "Ag Biotech Market Map: 245 Startups Using Biology & Chemistry to Revolutionize Agriculture"
"Ag Biotech Market Map: 245 Startups Using Biology & Chemistry to Revolutionize Agriculture"
Editor’s Note: Brett Morris is a principal at Kansas-based venture development organization TechAccel. 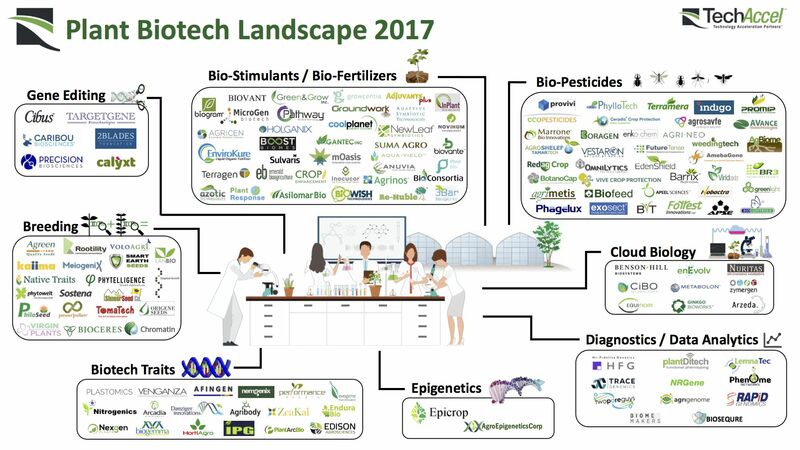 Here he lays out the nuances within 245 ag biotech startups and how TechAccel thinks about investments in this fundamental agrifood tech category. Ag Biotech (agriculture biotechnology) applies to all technologies used on the farm involving biological or chemical processes. It is a broad category involving many types of technology and science, including breeding, genetics, microbiome research, and animal health and nutrition. Ag biotech is a central component of the agrifood tech investing landscape with startups raising $262 million in the first half of this year alone — 23% of farm technology fundraising figures — as noted by AgFunder. To better evaluate and visualize the ag biotech market landscape, we at TechAccel started to create market maps as an internal project. Over time, we realized it could be a valuable resource to share amongst peers and industry outsiders, given the venture community’s tendency to focus more on digital agtech companies. There are 245 companies illustrated in the maps. According to our research, they have raised approximately $3.4 billion in total funding since they were founded: $500 million in animal biotech and $2.9 billion in plant biotech. Below is a summary of our ag biotech category definitions and some commentary around a few areas we find the most compelling for investment. Gene Editing is an ag biotech tool used to precisely insert, edit, or delete the DNA of an organism. In agriculture and animal health, breeders could utilize one of several approaches including CRISPR-Cas9, TALENs, and Zinc Fingers to create disease-resistant genes, improve health and nutrition, or enhance performance at a fraction of the traditional time and cost [compared with genetic modification or traditional breeding]. Today, we believe there are excellent investment opportunities to utilize gene-editing in higher value-niche crops that are closer to the consumer such as fruits, vegetables, and nuts. These crops have higher margins compared to row crops and less competition from major agriculture conglomerates, yet still represent large addressable markets.